Saumya , who was born in Mumbai India, met her South African husband, Siddharth, while he was on holiday in her home city in 2012. After a long distance courtship they married five years ago and settled in Century City. “We love it here. It’s so clean and green and I look out from our Waterstone West apartment over a beautiful water feature. It is so peaceful. We don’t want to go anywhere else, unless perhaps somewhere else in this precinct such as Waterstone Isles. Maybe we will manage that in a year or two,” she laughs while cuddling her adored Yorkshire Terrier, Scooby. Saumya, who comes from a family of doctors – her mother is an Obstetrician and Gynaecologist and her father a Cardiologist - is a medical intern at Tygerberg Hospital. She intends to start her specialisation in Obstetrics and Gynaecology in the next year or two. Her husband, Siddharth, is also a medical doctor at Tygerberg Hospital, and is currently doing his registrarship/training in Plastic and Reconstructive Surgery. It was Siddharth in fact who entered Saumya for the Mrs India South Africa contest. The first she knew about it was a phone call close to midnight on New Year’s Eve. “I was overwhelmed but delighted as this gives me the opportunity and a platform to really help empower women. 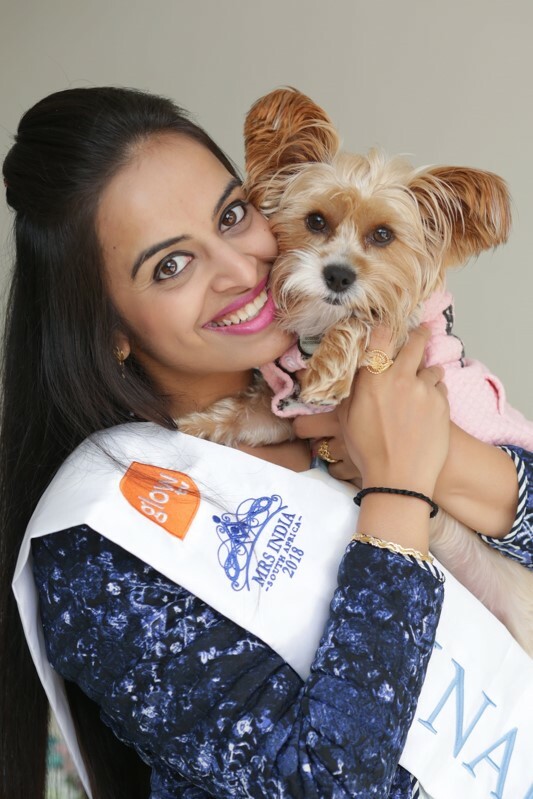 Saumya says she will be spending much of the next six months working for a number of charities – the SMILE Foundation and abused women and children in particular. In August after a trip back to India to finalise her pageant wardrobe, Saumya will be jetting off to Durban to compete against 24 other finalists from around the country. The Mrs India South Africa winner will automatically go forward to the Mrs India World Pageant. Saumya is the first Cape Town finalist in the 11-year old pageant and we wish her everything of the best in bringing back the crown to Century City, Cape Town!